tasty tidbits | KBK Bakery's Adventures in Baking! These little gems are so easy! And so tasty! We made these just as something little to do as we waited for dough to rise. Most of them did not make it through the night. We kept finding ourselves irresistibly drawn back to the tray full of little tasty tidbits. 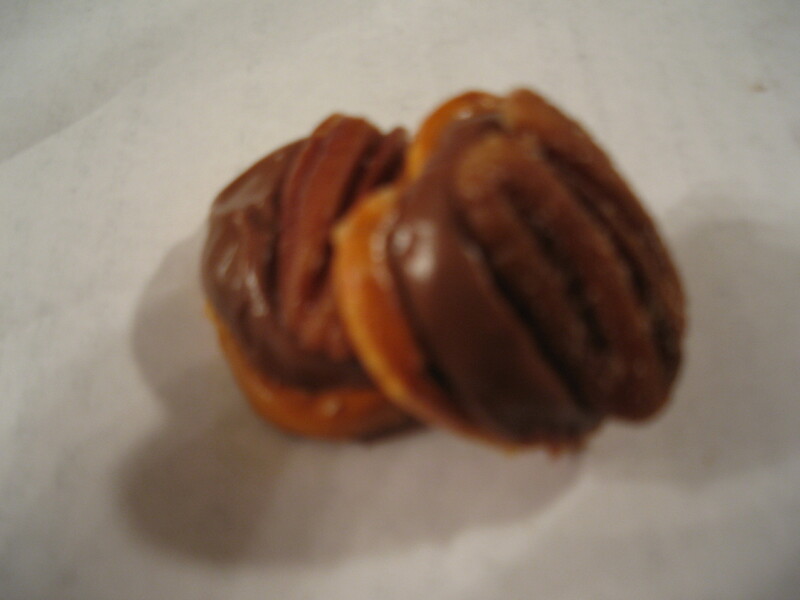 All you need is small pretzel twists, chocolate covered caramel candies (we used Rolos), and pecan halves. Lay out pretzels on a cookie sheet. As many as you want or will fit. Put a chocolate covered caramel candy on each pretzel. (Don’t forget to remove the wrapper!) Get your oven up to 350F and put your candy topped pretzels in. Leave them there for about 10 minutes. Take them out and press a pecan half onto each one. Let ’em cool a little. Hot caramel hurts! And enjoy!